Helicopter Emergency Medical Services (HEMs) paramedic Mike Patton was on the air desk when the call came through and he quickly tasked the air ambulance to the accident. The air ambulance arrived at the scene within nine minutes, along with members of the Northern Ireland Ambulance Service (NIAS) road crew and the Northern Ireland Fire and Rescue Service (NIFRS). 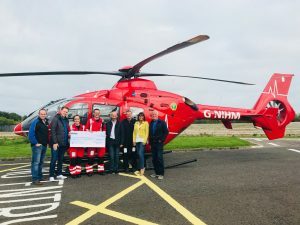 Even though the yard of the site was clear of obstacles, the landing proved to be challenging for the air ambulance due to the significant amount of dust which was created as the helicopter came into land. Damien’s road to recovery has been long, undergoing a further operation, two incidences of MRSA, which required surgery, and a requirement for a Picc line to allow for regular antibiotic treatments by a team of dedicated Rapid Response nurses who called daily at his home over a period of 16 weeks. He is also likely to require three further surgeries, however, thanks to the initial care of the HEMS team, the work of the Belfast Trust and the follow up surgery, Damien’s arm has been saved.